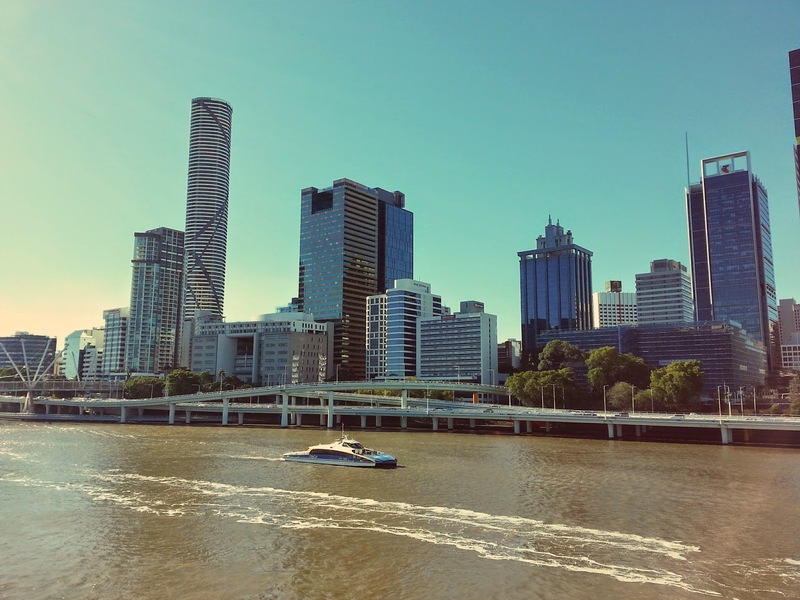 I woke up my first morning here by myself and stumbled jet-lag disoriented out of the YHA hostel and down a busy street in Brisbane’s Central Business District in search for coffee. I passed a gentleman with what looked like coffee and asked him where he got it. “There’s heaps of coffee shops two blocks down, mate,” he replied. In one of my first interactions with an Aussie, I heard two very common colloquialisms, namely: the words “heaps” and ” mate.” I found a shop full of sharply dressed young adults and I got in line, acting as if I was from the area. But, when my order for “a coffee” didn’t come through to the barista, I was a bit flustered and just said, “black,” which she took to mean a “long black.” In Australia all coffee is espresso, unless it’s instant. So if your like me, the 4.70 is worth it. A long black is like an americano and the popular “flat white” is espresso with a tad bit of steamed milk. Flat whites are my new thing, though I do really miss a Caravan Zinho Peaberry pour over. Long black and breakfast sandwich in hand, I returned up the street towards the hostel, where I would soon meet the rest of my American classmates and program directors. We spent the following few days in program orientation at the hostel and enjoyed local restaurants downtown, including Pancake Manor (a pancake restaurant in an old brick chapel, giving off “A Night’s Tale” medieval vibe with streaming pop music over breakfast for dinner). We also had Australian BBQ, Korean and Thai. 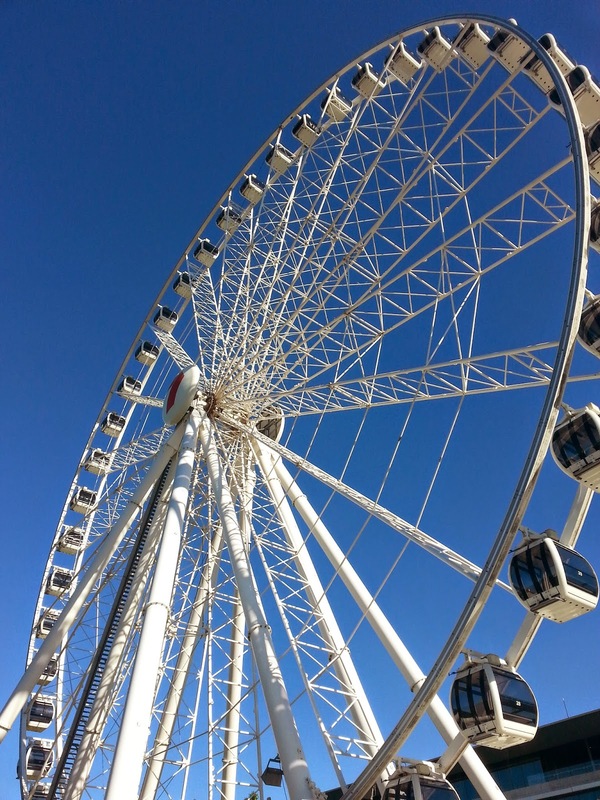 We took a ride on the Wheel of Brisbane, Brisbane’s version of the London Eye and got good views of the city. 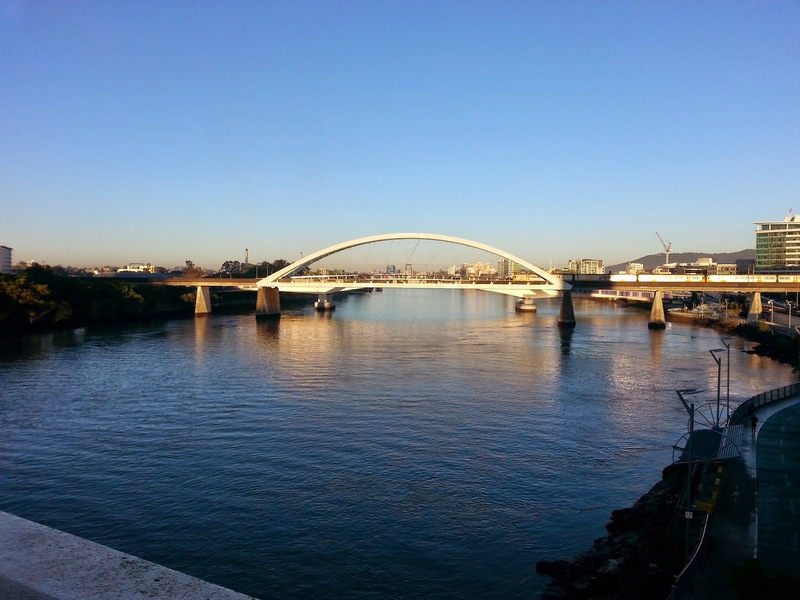 The Brisbane River, a muddy winding water way curves through the city, reminding me of Portland’s Willamette. The city’s transportation system operates a frequent ferry schedule and you can get places very quickly. According to our program director, Bull sharks make their home in the river, which is probably why I have yet to see an Aussie taking a dip. Not to mention, it’s winter here. Australian Winter in Queensland (Brisbane’s state which occupies the northeastern region of Australia) is perfect compared to Oregon Winters. It’s rarely cloudy and rain has really only come once during my time here. The daily temperature fluctuates between about 15 and 25 degrees celsius, which is probably around 50 to 65 fahrenheit. On Thursday of last week our group bussed to the campus of Christian Heritage College in Mansfield, about a thirty minute drive from downtown where we will be enrolled in classes this semester. We joined their new students enrolling for the first time in their typical CHC orientation. We sat through various workshops covering details of our academic semester and met other students. We participated in what was called a “coffee crawl,” (the tame version of a pub crawl) which meant a guy named Caleb speeding us around Brisbane in a mini bus to get coffee and Italian hot chocolate. My Aussie mates (friends) are quite down to earth and seem to really enjoy the simplest of things. I appreciate that and feel very welcomed by them. Aussie humor is sarcastic and relaxed. I spent Saturday afternoon learning my bus route into downtown and enjoyed being a foreign observer at the Queen Street Mall. This is an outdoor mall full of shops, cafes and there is constantly heavy foot traffic flooding Queen Street. Besides the many street musicians, a live band and decent audience was present in the massive flow of people. Getting home was painless, and I was starting to feel confident on the city busses. Monday however, demonstrated my lack of experience when I took three busses to get to my first class and they all got me nowhere near campus. I consulted three bus drivers, spent a fortune on fares and had to wipe dripping sweat from my face before walking into class twenty minutes late. My lecturer was gracious. I have taken three classes so far and being away from the distractions involved with home life, I am having a lot of interest engaging well during lectures and with course work. One of our program courses taught on Aboriginal Cultures is fantastic and very compelling. The content we are covering about Aboriginal cultures includes the fascinating way of community life involved within their tradition, how they have been united with their land and people group. They have said: “we don’t own the land, the land owns us.” However, when the tragedy of European imperialism and colonialism forces them from their land, there are deep wounds and terrible fractures that echo through history. The class attempts to engage a Christ centered theology and view of Aboriginal cultures. It is a very controversial thing to be learning in a western education system here in Australia and CHC is taking a risk by teaching it. But I am thankful they are and saddened by the truth. Obviously, I cannot help but relate this to where I live, the land I call my home and those who lived their before me. The two ministry courses I am in are very inspiring. My lecturers are very kind and excited to have me in class. In Ministry Formation, we are discussing the crucial marriage of theology and ministry. In History of Christian Though and Practice, we are focusing on individual topics and discussing their influence in the church at a chosen time in history. My lecturer affirmed my idea of discussing how modernity has influenced ecclesiology. I am particularly interested in how ideas of western reasoning has shaped the way we as evangelicals typically do things on Sunday morning and the potential limitations in our ecclesial practice because of it. This will take the form of a 3000 word paper I write, which is one of two for the course. The Australian education system is different in that there are no weekly assignments. We have two assessments (papers) to write during the semester and our lectures and texts act as guides along the way. I am getting to know the other ministries students and they seem to enjoy an American in the classroom who comes from this “weird” Quaker tradition, a bit of a contrast to the pentecostal majority. I don’t know if I will come back home any more charismatic, but I believe getting away from my contemplative tradition will be healthy and challenging. Today I started my service placement, which is a community serving focus of the ASC program. On Thursdays after class, I take the bus to Regis of Bulimba. This is an elderly care facility where I am to volunteer thirty hours this semester. I had bus confusion again getting there, but the workers were forgiving. I met my supervisor and two individuals conducting a mock Commonwealth Games for a room full of elderly individuals. I think Don, one of the workers who ran the games and works at Regis doing activities and such is about as close as one can get to an angel. He has such a tender heart for the residents and I believe I will be learning a lot from him this semester about Christ’s love. I sat with a resident named John and he told me about being in a war and going cold turkey and recited for me from memory one of his published poems. Sel, another resident asked if I was in University, if my Dad was around and then repeated those questions nearly a dozen times over the course of the mock shot-put event. He reminded me of my Grandma back home: not fully present mentally, but able to laugh. Maybe that’s all that matters. Tomorrow we have our View from Australia course which is an experiential all-day class with the ASC group. I’m excited to be back with them again and there is talk about going to a Koala sanctuary on Saturday. This post has gotten a bit long and it is time for me to get ready for sleep. I am feeling thankful and excited about what’s to come. ← Planes, Trains, and… Nope, Just Buses.